The Georgia DOT TAMP is available here. Georgia DOT's TAMP describes Georgia’s current bridge and pavement asset management processes for improving and preserving the condition of the National Highway System. The TAMP includes information on asset inventory and condition, risks, life cycle costs, strategic goals and objectives, and data that reports asset performance relative to stakeholder demands. 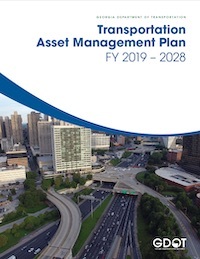 The TAMP is meant to help Georgia DOT allocate transportation funds with responsible stewardship and maximum efficiency. This document includes the following sections: Asset Valuation, Data Management, Financial Plan, Introduction, Inventory and Condition, Investment Strategies, Levels of Service, Lifecycle Management, Objectives and Measures, Performance Assessment, Process Improvements, Regulatory and Legislative Requirements, Risk Management.